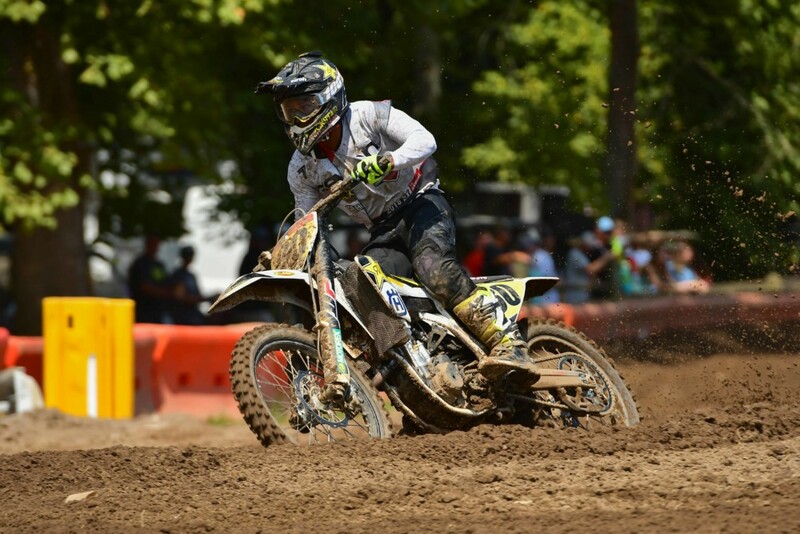 The 37th Annual Rocky Mountain ATV/MC AMA Amateur National Motocross Championship, presented by Lucas Oil, came to a close Saturday, August 4, with the fifth and final day of racing at the Loretta Lynn Ranch in Hurricane Mills, Tennessee. The last 14 races took place as temperatures and humidity were on the rise, with a total of 35 National Championships presented at the end of the day. Saturday’s racing action kicked off at 7:30 a.m. with 250 C Limited taking the track first. Tyler Uenaka would have a strong start to the day jumping out into the lead early in the moto. Uenaka would remain first until the checkered flag flew with Luke Fineis 18 seconds behind him. However, after earning 2-1-2 moto finishes Fineis would earn the National Championship. 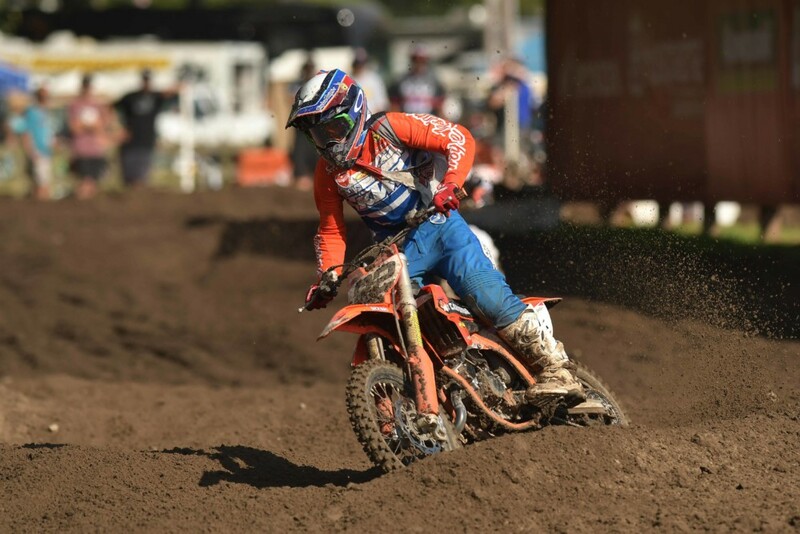 Ty Masterpool also had a good start to the day after getting out front in the 125cc (12-17) B/C and earning the win, which also earned him the National Championship this year. 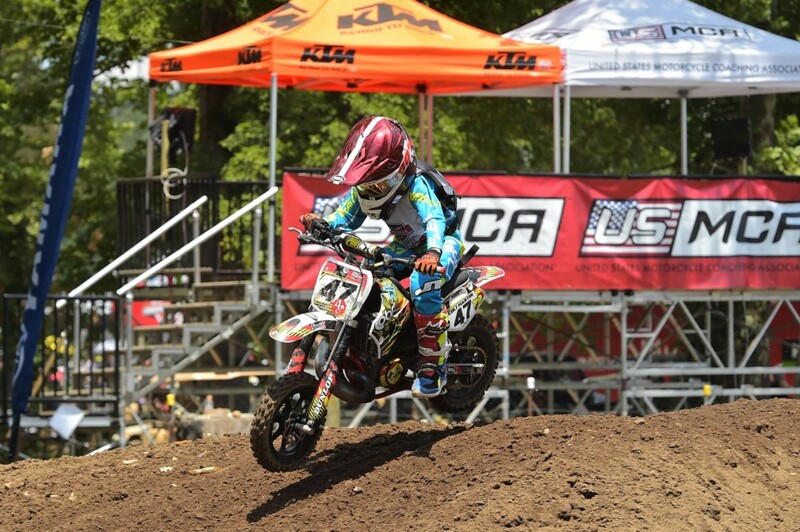 Levi Kitchen and Preston Kilroy came away with second and third at this year’s AMA Amateur National Championship. The Schoolboy 1 (12-17) B/C class was also controlled by Ty Masterpool today as he came away with the win going 1-3-1 for the overall. Caden Braswell won the Mini Sr. (12-14) Championship. In the 65cc (7-11) class, Haiden Deegan found himself at the front of the pack once again, and after finishing 18.3 seconds ahead of second Deegan earned the National Championship with a clean sweep going 1-1-1 this week. As the Supermini 1 (12-15) class took to the track it was Nate Thrasher grabbing the lead. Trying to close the gap behind Thrasher was Maximus Vohland, but he was unable to make the pass by the time the checkered flag flew. Thrasher went 1-1-1 to earn his second National Championship of the week. When the 250 B Limited class hit the track, it was Carson Mumford with a favorable start. After earning the win in the first two motos, Mumford would put his head down and push for a clean sweep on the class. After 10 laps, Mumford would succeed and earn the win and National Championship. Jace Kessler finished second followed by Colton Eigenmann in third on the day. After the moto scores were tallied it was Tristan Lewis and Kayden Palmer taking the top three overall spots in 250 B Limited. After earning the first two wins in Senior (45+) it was Terry Bostard who was looking to earn his third straight win of the week, however he would have some competition as the third moto came into play. Edward Walston would finish third and fourth in the first two motos but was ready to apply the pressure as the last moto took place. Walston would take the lead on the second lap and never look back, however behind him Bostard was having some trouble and finished the moto in fourth. Bostard would still earn enough points for the overall, followed by Walston and Dennis Bourque. Cristian Fernandez took the 450B Championship. 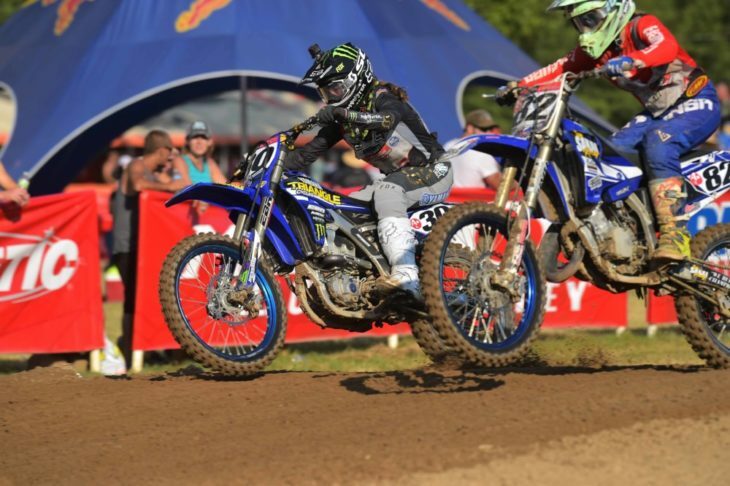 The Women’s Motocross Championship (WMX) Series took place Saturday, August 4 in conjunction with the AMA Amateur National Motocross Championship. Jordan Jarvis was the one to beat, after earning the first moto win ahead of Hannah Hodges and Shelby Rolen. Jarvis dominated both motos by grabbing the lead early on in the moto and keeping her focus as she competed to earn the overall win. Hodges and Rolen would round out the overall podium followed by Jamie Astudillo and Samantha Peters in fourth and fifth. On Friday, August 3, the first of 21 National Champions were crowned and the 450 B class was the first to run their third moto and crown a champion. Cristian Fernandez got out to a good start, jumping to the front of the pack on lap one. Brayden Lessler was back at the front of the field after a disappointing second moto Devon Xindaris made his way up to third finishing just behind Lessler as the checkered flag flew. Fernandez would go 4-1-1 and take home the first National Championship of 2018. Jalek Swoll won the 250 B Championship. Seth Dennis made his way to the front of the 51cc (7-8) Limited moto and secured his championship with a 2-1-1 moto score. In the 51cc (4-6) Limited class it was Ryder Darrigo who dominated the week with a three moto win sweep. The 51cc (4-6) Special Limited would see a three moto sweep as well with Colt Martin who would go 1-1-1 just ahead of Travis Schneider. In the 51cc (4-6) Shaft Drive Limited class, Brayton Kreglow found himself in championship contention early on in the week after earning the first two moto wins, after finding himself at the front of the back once again today, he took home the National Championship. Bode Bradford and Brayton Willis rounded out the top three. Colt Martin claimed the 51cc (4-6) Special Limited Championship. Another Pierce Brown and Jalek Swoll battle took place in the Schoolboy 2 (12-17) B/C class this afternoon. Brown would come around on lap one in the 20th position, with Swoll running first. 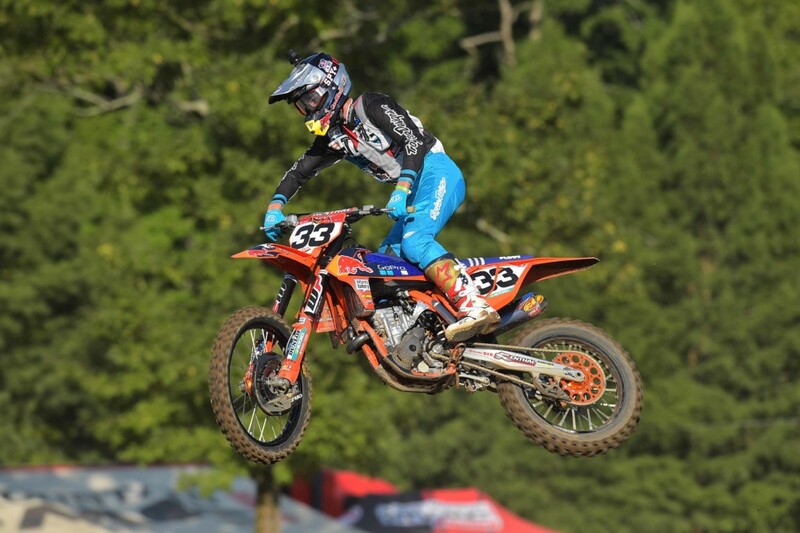 However, Brown was on a mission to earn the third moto win and try to recover his championship hopes. As the race wore on, Brown was making moves and Swoll seemed to be getting away. After putting his head down and pushing hard Brown found himself batting for the lead on lap nine of 11. Brown would make the pass stick, but with Swoll’s 2-1-2 moto scores he would earn the overall and National Championship. In the Junior (25+) moto it was, once again, Mike Brown and Ricky Renner at the front of the pack. Brown and Renner would swap the lead a couple of times, but ultimately Brown would earn the win and the National Championship over Renner. 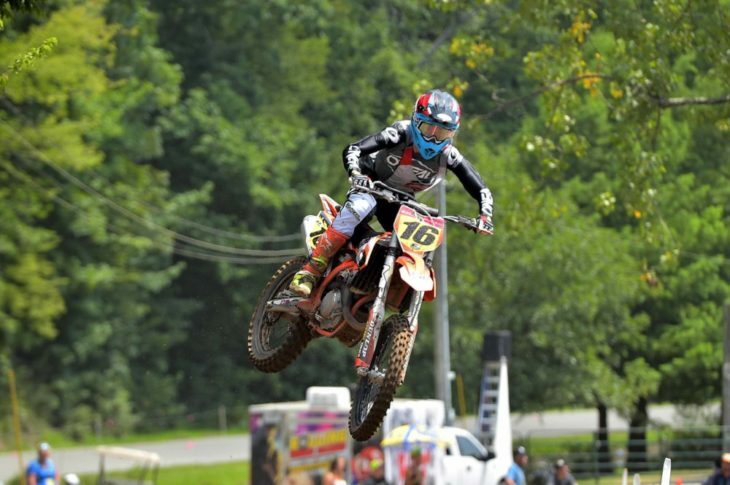 Levi Kilbarger earned third overall in moto three, finishing third overall too. Brad Smith and John Moeller rounded out the top five overall for this year. Jordan Jarvis (30) captured the Women 12-Plus Championship. She also won the WMX class, which was held in conjunction with the Loretta Lynn Amateur Nationals. The Open Pro Sport moto three would prove to be a tight battle between Seth Hammaker and Derek Drake. Drake had gotten out to the early lead and was holding off Hammaker until the lapped traffic became hard to dodge and Hammaker fought his way around as the white flag came out. Hammaker would take the moto win after a hard-fought battle all week long, but it would not be enough for the National Championship as that went to Derek Drake after earning 1-1-2 moto finishes. Mitchell Falk earned the third overall spot after battling at the front all week as well. Curren Thurman and Jyire Mitchell rounded out the top five. Click here for all the latest Amateur Motocross racing news.